the old man’s high score. 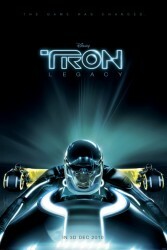 As its name suggests, Tron: Legacy is not really a sequel to the 1982 Tron, but rather a standalone new take for a new generation. That said, I cannot quite imagine approaching this film without the original as a reference point. It was a mammoth task from the start and I was sceptical about what I would find, particular when the target audience consists of those too young to recall the original. The plot is more a morality fable about the danger of chasing perfection. 20 years after Kevin Flynn’s [Jeff Bridges] disappearance, his wild child son Sam [Garrett Hedlund] discovers his father’s secret office and inadvertently gets pulled into the virtual world he created. Inside he finds father’s dream of a perfect world has been subverted into a dictatorship run by the program Clu [Jeff Bridges]. Sam and Kevin together race to escape through the portal back to our reality before Clu can invade with an army. While Tron takes itself seriously, it thankfully avoids attempting realistic explanations for the interaction between its world and ours, which would swiftly unravel. Many concepts and images are touched upon but left as unexplained ideas and the viewer is strongly advised to take a similar approach. This is essentially fantasy for the digital age, and we meet familiar fairytale personalities: the awkward, wide-eyed innocent Quorra (though she is far from defenceless); the eccentric extrovert information-dealer Zuse; and the merciless authoritarian villain Clu. Bridges, meanwhile, seems to be channelling Lebowski in his zen elder Flynn. Strangely Tron himself is rather overlooked. A superb Daft Punk soundtrack lends a suitably epic feeling, though the electronica retains a fittingly lighter edge than most brashly pounding Zimmer-esque scores. While certainly not every film ought to be made in 3D, Tron is perfect example of one that should. Its virtual world is brought to life with a sense of hyper-reality in a sequence transitioning between 2D and 3D. Like its predecessor, Legacy utilises every bit of the latest filmmaking technology to bring this stark black-and-neon world to life, and the results are spectacular. Recreating Jeff Bridges circa 1982 is an impressive feat, but the disconcertingly inhuman mouth movements make it evident that the digital actor is still not yet here. One might have forgiven this in the artificial Clu, but alongside other real-looking ‘programs’ he always stands out. Tron‘s biker fashion has been somewhat fetishised, while the retuned light cycles pack some new tricks that are a not necessarily an improvement in crafting tense moments. Nevertheless the choreography shows a liberating understanding of the lack of rules in virtual combat, with some gravity defying stunts and a varied arsenal of glowing digital equipment. Ultimately it’s the old gear that works best however: our first glimpse of the iconic and imposing Recognizer is as powerful as ever. Fans can rest easy that they should be more than happy with this beautiful, atmospheric return trip, but it is difficult to evaluate the response of a newcomer. Like Avatar, Tron‘s strength lies not in its story but in providing an incredible world for the viewer to experience. The original Tron was our first glimpse at a virtual world populated by avatars that has since become a reality. With Legacy, I wonder what the new generation — many of whom have grown up with these worlds — may find. While the stunning effects will have them craving more, the imprecise visual metaphors may leave them wanting. Great review, I can’t wait to see it! !